This comes from the work of Carl Jung. 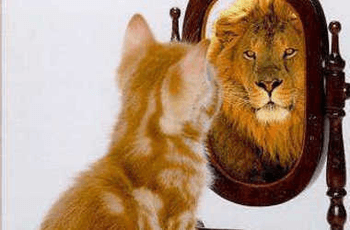 Now, what Carl Jung actually said was "Everything that you perceive outside of you, situations, circumstances, events, people, etc., are all a projection from inside of you." He said that as soon as you become aware of it, it's you. So in a way what Carl was actually saying is very similar to cause and effect. He's saying that all that you actually have about the world around you and the people around you is your perception. There's no way for you to actually know what's really going on outside of you. All you have is your perception. And your perception of that is created from a projection inside of you, which is why you might have had this experience. Let's say you're going off to meet somebody for a job at work and you mention it to someone who sits next to you at work. And they say, "Oh, no. You're not gonna meet them are you? I met them last week. I don't know, they were really awful." And you got along to this meeting, and you're really dreading it, and you get there, and this person is wonderful. You got on really well of them. You got a really good result from the meeting. And you go back, and the person who sat next to you said, "Well, how did it go?" And you go, "I don't know what the problem was. They are wonderful person, fantastic person, got on really well, really happy. Great. Got fantastic result, really easy to work with." Now the person next to you can't believe that you're actually talking about the same person. Well, you're talking about the same person, but you're talking about two different perceptions of the same person, two different projections of the same person. I heard a story once which I think you'll find quite interesting, which was a story from California. And the education authority in California decided to do an experiment. And what they did was they took two teachers from the whole state of California and they said to these two teachers, "We'd be doing some research, some study, and found that you're the two best teachers in the entire state of California." Of course, these two teachers were totally thrilled, proud, that they were, in fact, the best teachers in the entire state of California. And the education authority asked them a question and said, "We'd like you to take part in an experiment for a year. What we'd like to see is what happens if we put the best students, the best pupils from the entire state of California with the two best teachers from the entire state of California just to find out what's really possible from education." And of course, these two teachers were absolutely delighted to take part in this. And they went brilliantly. The results from the students and the pupils got were phenomenal. And at the end of the year, the education authority bought the two teachers and again to review the results and, of course, the results were, as I said, absolutely incredible as you'd expect. But then the people who set up the experiment said to the two teachers, "We've got a little bit of a confession to make. The children that you were teaching weren't the best students in the entire state of California. We picked them at random. Some of them were really good. Some of them have been thrown out of every school they've ever been in since they first started going to school." The two teachers sat there rather smartly and said, "Well, I guess it just goes to show what happens when you put these children in front of the two best teachers from the entire state of California." And then the people who set up the research study once again said, "Well, we've got another confession to make. We picked you at random, too." What happened in that situation was these two students who've gone in, they totally believed that they were the best two teachers in the entire state of California. And they totally believed that they were teaching the best pupils and students in the entire state of California. So from a perception is projection point of view, they projected success onto the students. So that when those two teachers were around, they acted like the best students in the entire state of California, being in front of the best two teachers in the entire state of California. And so then the perceptions of the people involved in the experiment created what they expected. So here's my challenge to you again for next week, few days while you are waiting between sessions, between videos, start noticing what you perceive about the world outside of you, the people around you, the people you work with, the people you live with, the events around you, the things that you read in the newspapers, what you see on the TV or on the computer, and start asking yourself the question, what if perception is projection and this is whole me, how am I projecting this outside of me into my world? Now, there'll be certain things as you look outside of you and you'll say, "Oh, that's me. That's wonderful. Aren't I a wonderful person?" And there might be other things that you look out and you say, "Okay, perception is projection is okay. I could see how it could've projected all these wonderful things. But this thing here, this thing's not so wonderful. This must be someone else." Well, it doesn't work that way. It's black and white. So there may be some things in your perception which are not okay with you, things that you don't like, things that you don't want. So if that's all your projections, what do you need to do to change your projections so your perceptions of the people outside of you, the people around you change? This is particularly important in relationships. Because one of the things that Carl Jung actually said was, "You marry your unconscious mind." We'll talk about your unconscious mind on another video later on. But your unconscious mind is basically everything thinking of right now, things that you're not consciously aware of. And Carl Jung said, "You marry your unconscious mind," so the thing that you project onto your partner in life, your husband, wife, boyfriend, girlfriend, is actually the stuff about yourself that you're most unaware of. That can be stuff that you like and stuff that you don't like. But it is the reason why your partner in life has the ability to drive you crazy every now and again. Now, where most people go off track with this in relationships is they think it's their partner. But in actual fact, it's your projections. You may have heard the saying, "When there's one finger pointing out, there's always three fingers pointing back at you." Most people think it's out there and it's them, whereas, successful people go, "Okay, this is all me. This is my projection. This is my creation. How do I go about changing what's inside of me so that I can see the result outside of me?" Here's is another reason why you might want to do that. As long as you're pushing the problem away from you, you're pushing the problem outside of you, situations, circumstances, and people, you're also pushing the solution away from you. As soon as you pull the problem inside of you going, "Okay, this is my creation. This is my projection," then also, as you're bringing the problem inside of you, you're also bringing the solution inside of you.